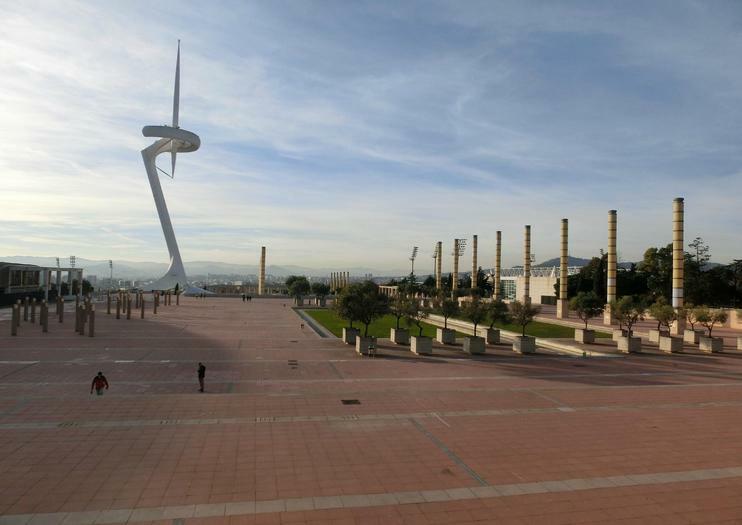 The 1992 Olympics were transformative for the city of Barcelona. With the arrival of the games, areas were restored and construction for new structures was initiated. As such, the city was updated and rejuvenated in many ways. One such structure, which remains a draw for visitors today, is the Olympic Stadium — which is now home to the city’s second futbol team, Espanyol. It was originally constructed in 1929 for the International Exposition, and was updated in preparation for the games. It can seat more than 65,000 people. A visit now offers a glimpse into sports history, as well as some great views of the city. It was the venue for both the opening and closing ceremonies of that year’s Olympics. Walking through the competitor’s tunnel, you can really get a feel for how athletes must have felt as they experienced the vastness of the grounds. To get to the Olympic Stadium on Barcelona’s public transport, take the green line of the metro to Plaza Espanya. It is about twenty minutes walking from the station up to the Parc of Montjuic. The stadium is open daily during daylight hours and is free to enter. Marvel over La Sagrada Familia, stroll down colorful Las Ramblas and take in the views from Montjuic hill on this 4-hour city tour. Your private tour can be tailored to suit your interests, so you can take in modernist wonders like Casa Batlló and Casa Mila, peek into the shops along glamorous Passeig de Gracia, or explore Barcelona’s Olympic park. See Barcelona’s principal attractions while pedaling effortlessly on an electric bike. This 4-hour private e-bike tour visits all of Barcelona’s World Heritage monuments, covering a total of 16 miles (24 km). You’ll see Barcelona’s famous Sagrada Familia Basilica, along with ancient castles, fantastic views, the 1992 Olympic stadium and more. Enjoy our unique Electric Bike (e-bike) guided tour around Montjuïc. Powered by state of the art electric bikes, you can effortlessly climb Barcelona’s mountain to see the city’s most beautiful sights. In this 3 hour guided tour you will learn all about the past and present of the Montjuïc, one of the most important areas that has shaped our city. Discover Barcelona’s landmarks and highlights on a 5-hour, guided tour with an experienced guide. Enjoy unobstructed views of the glamorous Passeig de Gràcia from a panoramic bus, and spot Gaudí’s most famous modern homes. Take in the sites along the Mediterranean coast, with time to see the Olympic stadium, then board a scenic cable car to get stunning, aerial vistas of the city. Explore the Plaça de Catalunya on foot with a walking tour through the narrow lanes of the Gothic Quarter and historic center landmarks. Experience the top sights of Barcelona on a 4-hour tour with a private guide. Start out in the Montjuïc neighborhood to see the Plaza Espana, Magic Fountain, National Palace (Palau Nacional) and other buildings from the 1929 World’s Fair. Then drive along Via Laietana or La Rambla, and have time at the Sagrada Familia to take in the wondrous architecture of Gaudi. You’ll get photo ops of other Gaudi masterpieces including Park Guell, La Pedrera and Casa Batllo as your guide shares informative commentary about this lovely Catalan city. Discover Barcelona’s history, culture and architecture on a full-day sightseeing experience with a combination bus and walking tour. Get a comprehensive overview of the city as you drive the Passeig de Gràcia, coastline and Olympic Village, then enjoy fabulous views from a scenic cable car. Trace a route through downtown to Plaça de Catalunya, then continue on foot to explore the narrow, historic streets of the Gothic Quarter. Experience Barcelona’s Modernist movement firsthand with a tour of Gaudí’s most important designs, from Sagrada Familia to Park Güell and private homes. Raise your Barcelona visit to new levels of fun during this 3-hour private walking tour of the city’s Montjuic Mountain with an experienced tour guide. Ascend to the top of this iconic mountain by cable car, enjoying spectacular city views along the way. Spend your trip strolling past the mountain’s numerous attractions, including Montjuic castle and the Palau Sant Jordi. Your guide, cable car ride, castle admission, public transit tickets and gay-friendly welcome pack are included. Taste and explore Spain and Portugal within 8 days with many fascinating UNESCO World Heritage Sites. Starting in the capital of Portugal, Lisbon, visiting Toledo, an old city with extensive cultural and monumental heritage experience. Then continue your journey to Madrid with its magnificent and historical grandeur. And then head towards the warm and charming Spanish coastal city Zaragoza and Barcelona. Also, enjoy the sightseeing in the beautiful Andalusian area Granada, the Red Palace in Alhambra, Costa del Sol and the historic Seville. Back in Lisbon, you will visit Belém Tower and Jerónimos Monastery, both also classified by UNESCO as a World Heritage Site. After all those vibrant and fascinating cities and palaces you will be back in Lisbon with an unforgettable experience! Discover the top attractions of Barcelona and Montserrat with your own private driver-guide on a comprehensive full-day tour. See the historical districts and architectural gems of downtown Barcelona, including Gaudi’s Sagrada Familia. Take in sweeping views from Montjuïc and stop at landmarks such as the Magic Fountain and the Palau Nacional (National Palace), built for the 1929 World’s Fair. In Montserrat, view the famous statue of the Black Madonna (La Moreneta) in the monastery, ride the funicular to the top of the mountain and perhaps hear the children's choir. Explore Barcelona on this 4-hour private tour. Your expert guide will bring you to some of the city’s principal landmarks and most interesting neighborhoods in a private vehicle. Visit Montjuic to take in stunning views and see the 1992 Olympic Park, check out Barcelona’s famous shoreline and discover the bohemian neighborhood of Gracia. This tour is customizable, allowing you to see the sights at your own pace. Experience the best of Barcelona on this private tour. Settle inside an air-conditioned Mercedes with a driver-guide, and hear about Barcelona’s history as you travel around the top attractions. Cruise up Montjuic Hill for panoramic city views, see the Gothic Quarter and Barcelona Cathedral, and witness Las Ramblas and the flamboyant modernism of the Passeig de Gràcia. Finish at La Sagrada Familia, the church designed by Antoni Gaudi that’s now an icon of the city. Price is per vehicle, based on a maximum of three passengers.